Shri Nathji is the Pradhan swaroop (main deity) of Pushtimarg.The temple of Shri Nathji is situated in Nathdwara (a village in the Rajasthan state of India) near Udaipur.It was Shri Nathji himself who told Shri Vallabh (Shri Mahaprabhuji) to propogate Pushtimarg in this world. 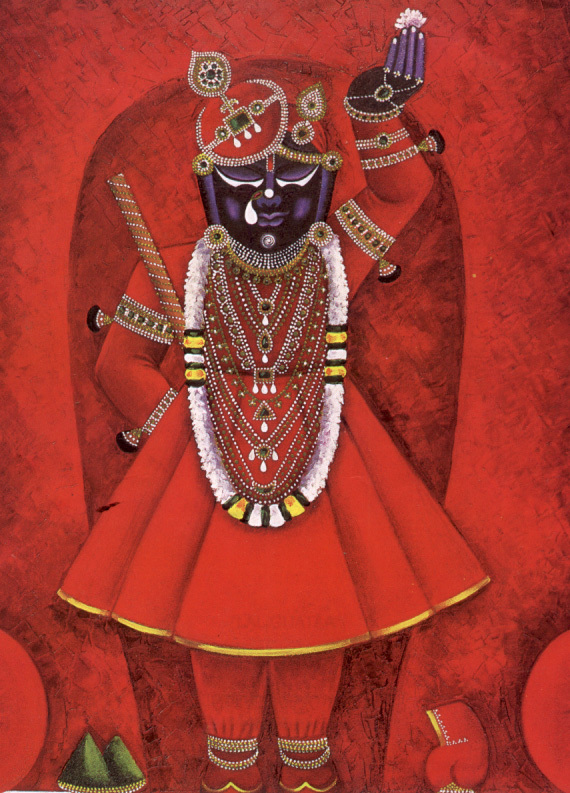 A beautiful story is related to the Prakatya (appearance) of Shri Nathji.About 550 years ago Shri Nathji appeared on the mount Govardhan in Jatipura village near Mathura.Shri Nathji's raised hand (left hand)appeared from mount Govardhan first,slowly after many years Shri Nathji's Mukharvind (face) was seen.Even before Shri Nathji's Mukharvind was seen the people of the surrounding areas began to worship him thinking that he was a deva (God) and they used to take milk to serve Shri Nathji.These peolpe served Shri Nathji's raised hand for 60 years. Later Shri Nathji gave a vision to Shri Vallabh that He wanted to live in a temple.So Shri Vallabh came to Jatipura and had a temple constructed for Shri Nathji where he started the Pranalika (rules) of doing sewa and shringar. But Shri Nathji did not wish to stay in Jatipura forever,so he produced a cause for doing so. A rumour spread in Vraj that Moghul emperor Aurangzeb,who was destroying Hindu temples, was coming to Jatipura.Hearing this the Goswami Balaks of that time decided to take Shri Nathji to Gujarat.In the year 1669 A.D.(Vik.Sam.1723) Shri Nathji started his journey to the south,for the state of Gujarat.The caravan took a route from the cities of Agra,Chaupasni(near Jodhpur),Kishangadh and came to Singadh(Nathdwara) in Mewar (now in the state of Rajasthan) where the wheel of Shri Nathji's chariot suddenly got struck.It didn't budge even after a lot of effort was made to get the wheel free.The then Tilkayat decided that Shri Nathji wanted to stay at this place and so had a temple built for Shri Nathji at that place itself.In this way in the year 1671A.D. (Vik.Sam.1728) a new temple was built in Nathdwara.Till today,329 years after this incident,the sewa of Shri Nathji is still done at Nathdwara (also known as Shri Nathji). Pushtimarg is a Bhavna pradhan sampraday,in it bhavna is very important.According to the bhavna of Pushtimarg Shri Nathji is a small child,only 7 years old.Shri Nathji's right hand is kept on his waist while the left hand is held up in the air.The bhavna reagarding this posture is that Shri Nathji is standing at the gate of a Nikunj.That is why Shri Nathji is also called Nikunj Nayak. Shri Nathji is the pradhan swaroop (main deity) of Pushtimarg.Every Vaishnav must be humble infront of Shri Nathji. Note: In this chapter a brief introduction regarding history and the swaroop of Shri Nathji is given.Though the bhavna is very lenghty but all the chapters are written for the Vaishnavas with minimum knowledge of Pushtimarg or for the small and young children so the detailed bhav-bhavna of Shri Nathji is not written here.Those who are interested in reading the full bhavna can read it from the various books published on this topic. Who is Shri Nathji? What order did He give to Shri Mahaprabhuji? Shri Nathji is the Pradhan swaroop (main deity) of Pushtimarg.He told Shri Mahaprabhuji to build a temple for himself and start the sewa pranalika. Where did Shri Nathji Appear? How? Shri Nathji's prakatya (appearance) is from the mount Govardhan in Jatipura near Mathura. Why did Shri Nathji go to Nathdwara? Shri Nathji did not wish to stay in Jatipura forever.He had also promised a Vaishnav named Ajab Kunvarbai that he would come to her house one day.So to fulfill his promise Shri Nathji went from Jatipura to Nathdawara.